In just a couple of months, I will be travelling to the Okanagan to take part in the 5th Annual Lake2Lake Ride for Rwanda, an event I look forward to every year. While this year marks the 5th anniversary of Lake2Lake, it will in fact be the 9th time that I have taken on a major cycling challenge to raise funds for The Wellspring Foundation. So why do I continue to ride year after year? The reason is simple: I truly believe in what Wellspring is doing. I care about education, and about giving children in Rwanda the opportunity to receive a quality education. Having visited Rwanda twice to see this work first-hand, and as a teacher myself, I see the revolutionary impact that Wellspring is having on education in Rwanda, and I’m excited to play a part in this. Lisa after finishing the 2012 Lake2Lake. My journey with Wellspring began back in 2005, when the organisation was still in its early stages. I had been volunteering in Uganda, and had the opportunity to visit friends in Rwanda for a couple of weeks. During this time, I visited a couple of the schools in which Wellspring was working, and assisted with some teacher evaluations. I could clearly see the impact that Wellspring training was having on teachers and students, something that was reinforced when I returned there again in 2010. I have become more involved with Wellspring over the past 7 years, primarily fundraising for their programs through cycling. In 2006, my close friend Ben Farrant, an avid cyclist, was tragically killed while training for the annual Seattle to Portland Bicycle Classic. Ben was a member of the Wellspring Board, and was so passionate about Rwanda and Wellspring’s work there. The following year, I got onto a road bike for the first time, and began training for the Ben Farrant Memorial Cyclathon, from Seattle to Portland, in which our group of riders cycled to remember our friend, and to raise awareness and financial support for Wellspring in Ben’s honour. Including that inaugural year, I have ridden from Seattle to Portland six times with Wellspring. 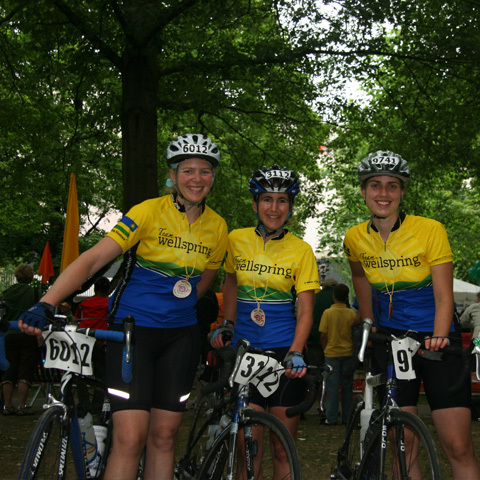 Lisa, Heather & Amy at the 2009 Seattle to Portland Bicycle Classic. 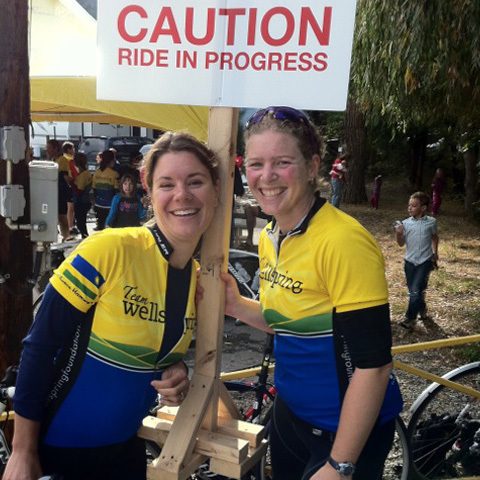 Over these years of involvement, I developed a love for cycling, and so was very excited to hear that Wellspring was planning to host their own ride here in BC. I had always wanted to cycle in the Okanagan, and Lake2Lake provided both the opportunity to ride through some beautiful scenic areas, and to support Wellspring’s work in Rwanda. I have taken part in Lake2Lake twice now as a rider, and once as a volunteer when an injury prevented me from cycling. This event is a fantastic opportunity to spend a weekend riding while sharing the experience with friends, and meeting new people. For me, Lake2Lake is a very stress-free weekend, as the only thing I need to worry about is riding. The volunteers take excellent care of the riders both on the road and at the camp once the first day of riding is completed. All details are taken care of, and so it really feels like a weekend getaway, filled with camaraderie and fun! One of my favourite things about Lake2Lake is seeing the variety of people who take part . Some riders show up on mountain bikes, having only ridden a handful of times, but choosing to bike this distance because they believe in the cause they are supporting. 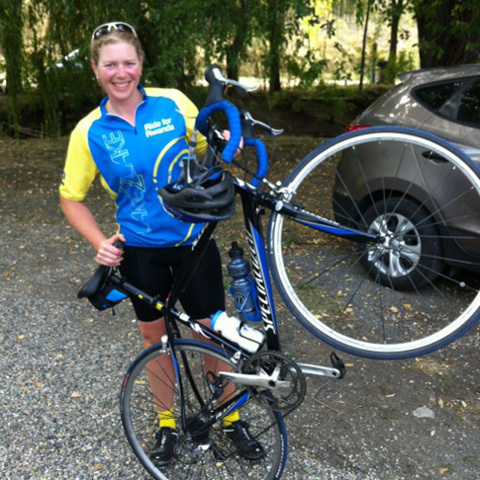 Other riders don’t know much about Wellspring, but love cycling and being on the open road. These individuals participate in the ride and are introduced to Wellspring throughout the weekend. Whether you are an experienced biker, or new to the sport, you are welcome to be part of this amazing event! Colleen and Lisa at the 2011 Lake2Lake. I hope you will come and join us for this year’s ride, and help make a difference in the lives of students, teachers, and entire communities in Rwanda! The Lake2Lake is a two-day fully supported ride from Vernon to Eagle Bay, in BC’s Okanagan/Shuswap, and takes place on September 20–21. Riders are welcome to participate as individuals or as part of a team of four, and those who fundraise may be eligible for a free jersey or ride registration. In addition, volunteers and riders who fundraise a minimum of $1200 will be entered into a draw for a trip for two to Rwanda. Home Ride Why I Keep on Cycling for Kids in Rwanda!